Care Bear Stamps: Sale-A-Bration ~ The Most Wonderful Time of the Year! Sale-A-Bration ~ The Most Wonderful Time of the Year! It's here! 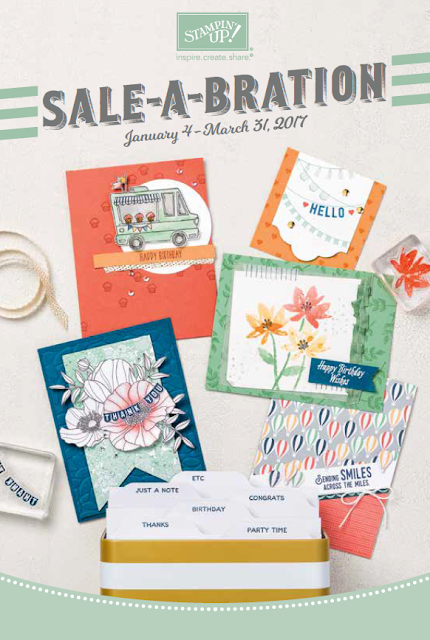 The most wonderful time of the year in the paper crafting world ... Sale-A-Bration! From January 4th until March 31st Stampin' Up is running it's most exciting promotion of the year! How does it work? You earn free products from the Sale-A-Bration Catalogue for every $60 of merchandise purchased. It's as simple as that! There are also added bonuses if you are interested in hosting your own party or signing up to purchase your own demonstrator starter kit. Just check out the Sale-A-Bration brochure above for all the details. Stampin' Up also has some amazing new products to view in the Occasions catalogue. Earning free products couldn't get any easier! If you are in the Calgary area feel free to contact me for all of your papercrafting & stamping needs! & Have fun Sale-A-Brating!